The manakins are a clade (Pipridae) of unique small suboscine passerine birds. The group contains some 60 species distributed through the American tropics. The name is from Middle Dutch mannekijn ‘little man’ (also the source of the different bird name mannikin). 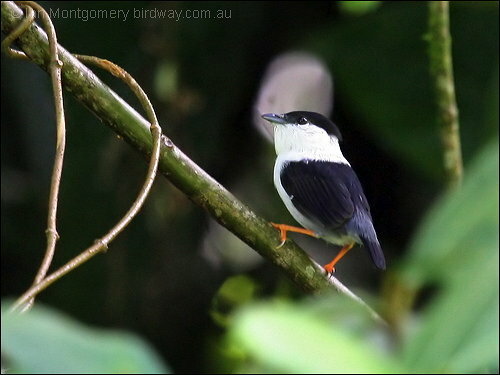 The genus Tyranneutes comprise the smallest manakins, the genus Antilophia are believed to be the largest (since the Schiffornis genus are no longer considered manakins). They are compact stubby birds with short tails, broad and rounded wings, and big heads. The bill is short and has a wide gap. Females and first-year males have dull green plumage; most species are sexually dichromatic in their plumage, the males being mostly black with striking colours in patches, and in some species having long, decorative tail or crown feathers or erectile throat feathers. In some species, males from two to four years old have a distinctive subadult plumage.